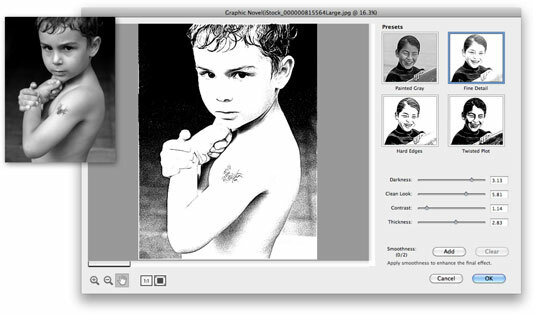 The new Graphic Novel filter in Photoshop Elements 11 takes a bit of experimentation to get the effect you want. But after you get your settings established, the look is quite interesting. It creates an illustrative look as if done with pen or graphite. In either Expert or Quick mode, choose Filter→Sketch→Graphic Novel. In the filter dialog box, choose from four presets. Darkness: A higher value creates more areas of lightness. Clean Look: A higher value makes smoother, more refined strokes. Contrast: The higher the value, the more contrast and darker overall an image appears. A lower value will produce a lower contrast, light gray image. Thickness: Affects the thickness and blackness of the outlined strokes. A higher value produces a “goopier” stroke appearance. Smoothness: Fine-tunes your edges and enhances the overall filter effect. Adjust your view as needed by using the following controls. Zoom: Zoom in and out for your desired view. You can also use the 1:1 view (recommended) or Fit in Window view. Hand tool: Moves you around the image window when you are zoomed in. Click OK to apply the filter and close the dialog box.